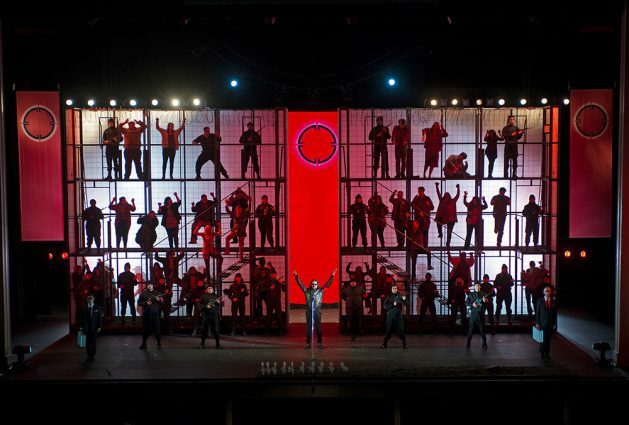 Cincinnati Opera’s U.S. premiere of "Another Brick in the Wall"
Pink Floyd’s “The Wall,” one of the most iconic works in the history of rock music, has found its way to the opera stage, and unlike some collisions of the classical and rock, this one is no gimmick. 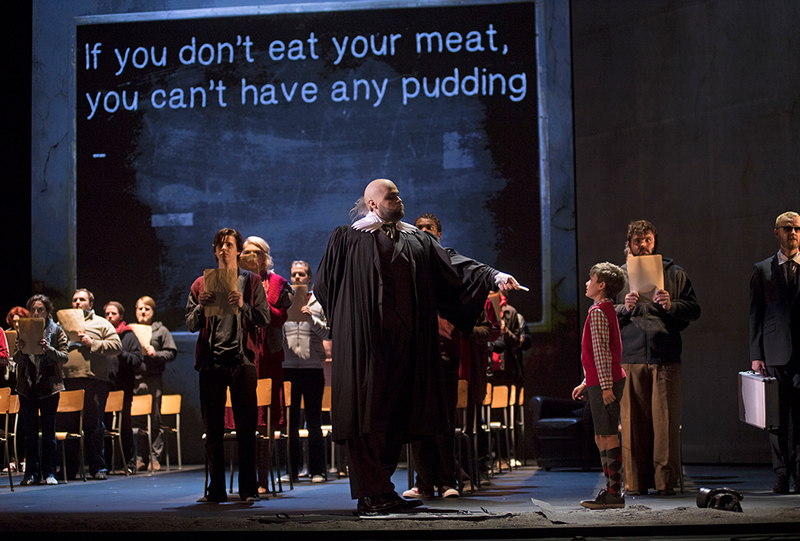 “Another Brick in the Wall,” a co-production between the Cincinnati Opera and Opéra de Montréal, is a massive spectacle, featuring a full orchestra, a chorus of nearly 60, and a stellar cast of soloists. Pink Floyd bassist Roger Waters is responsible for the libretto to Julien Bilodeau’s shining score, and the result is a familiar but wholly original work which should have plenty to satisfy fans of Pink Floyd and traditional opera alike. “The Wall” was released in 1979 and went on to sell nearly 25 million copies. The record was inspired by the death of Waters’s father in World War II, as well as the increasing alienation the group felt from their audiences as they graduated from theaters to arenas to football stadiums. Things came to a head with a 1977 incident in Montreal in which Waters spit in the face of a rowdy fan. That encounter was Waters’s spark to write “The Wall” but was never explicitly referenced on the album. Here, it is portrayed in slow motion during the opening scene of “Another Brick in the Wall” and becomes the impetus for Pink’s descent into madness. Over the course of the opera’s first act, Pink revisits the events of his life. Those familiar with “The Wall” will find its 26 songs present and nearly in order, with a few savvy shufflings (“Goodbye Blue Sky” gets a bump to coincide with the World War II sequence, for example). Waters, who agreed to pen the lyrics after initial skepticism of the project, also retained much of the dialogue from interludes. Bilodeau’s score is the opera’s true triumph. Motifs and melodies from Pink Floyd’s original music materialize and flit away, often in unexpected places, but for the most part, the French composer charts his own course. The program notes cite the minimalism of Philip Glass, which can certainly be heard in the feathery arpeggios lent to “Another Brick in the Wall, Part 1,” but the opera spends significant time in the realms of eerie atonality and lush ambient textures. Baritone Nathan Keoughan is excellent in the lead role as the shellshocked Pink, taking account of past traumas and collapsed relationships. France Bellemare and Caroline Bleau reprise their Montreal roles as Pink’s overprotective mother and neglected wife, respectively. Bleau is particularly spectacular, a bolt of fierce energy across the stage every time she enters. Visually, too, “Another Brick in the Wall” sets itself apart from the source material. Gone are Gerald Scarfe’s iconic animations, replaced with magnificent new video work by Johnny Ranger and Olivier Ouellet. The films are splashed across the giant moving sections of the titular Wall, which form most of the minimalist set. Marie-Chantale Vaillancourt’s costume design manages to brilliantly evoke both the grim reality of Britain during the Second World War and the excesses of the rock scene of the 1970s. Ultimately, both “The Wall” and “Another Brick in the Wall” are about the disconnect between people and the lingering traumas of everyone touched by war. Large portions of this opera are staged with adult Pink staring across the stage (and across decades of time) at himself as a child, contemplating the turns that took him to this point in his life. 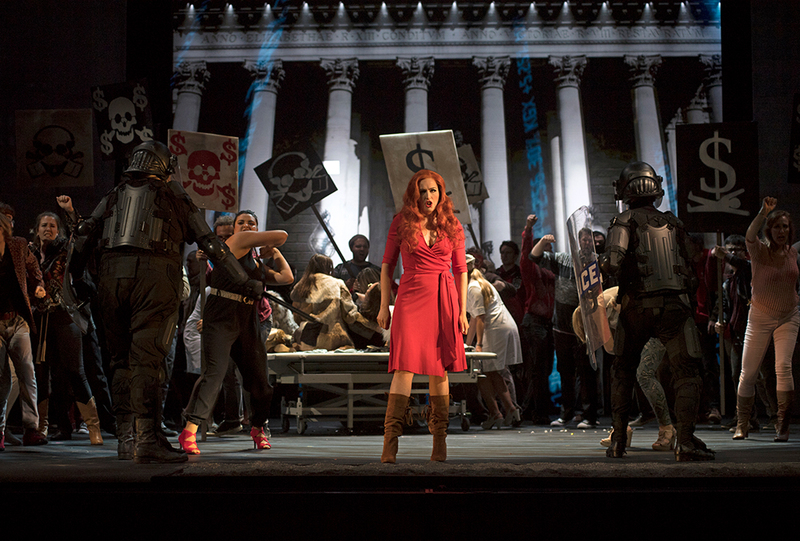 Even if the second act’s fascist interlude is a fever dream metaphor, the sociopolitical implications of interpersonal barricades remain as relevant as ever. “Another Brick in the Wall” is an entertaining and novel interpretation of an iconic work of 20th century pop culture, but must also be taken on its own merits as an opera with a lot to say. Nat Tracey-Miller is a Cincinnati-based high school librarian, musician, cartophile, and lifelong music fan whose love spans from Bowie to Beethoven to Bon Iver to Brubeck and hits every point in between. His writing has appeared in CincyMusic, Columbus Calling, Tome to the Weather Machine, Mixtape Methodology, and more. He records as The Birds of America, and is currently completing his first EP.